This scene from 1982 is swiftly followed by another important moment twelve years later when Mevlut, who has spent much of the intervening time making a living selling boza as a street vendor (boza is an alcoholic drink which is sold under the premise it is not alcoholic and therefore acceptable for Muslims to drink), is robbed on his nightly rounds, and decides that perhaps his boza-selling days are over. 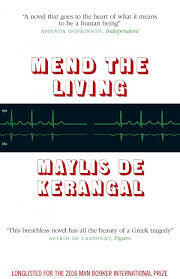 For this reason, the novel becomes very reliant on how interesting the reader finds Mevlut. Unfortunately, Pamuk’s primary purpose, that the novel tell the story of an ordinary, unassuming Turk, rather conflicts with the detail in which he feels it necessary to tell that story. There is certainly something to be said for presenting Mevlut’s day-to-day, year-to-year struggle to make a living, particularly when faced with the corruption of Istanbul, but to sustain this over such a length is another matter. Of course, many critics will tell you that Pamuk’s real subject is Istanbul and this certainly seems to be how he sees himself. 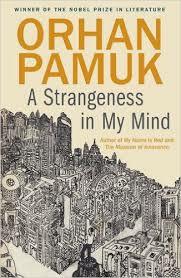 Pamuk choreographs his characters so as to create a map of the city’s development over the last fifty years. When compared to other novelists associated with a particular city, however – Dickens and London is the most obvious example – Pamuk’s view of Istanbul seems cosily nostalgic. Mevlut’s career as a boza seller is the most obvious example of this: despite Pamuk’s acknowledgement that this is a difficult, poorly rewarded (and, ultimately, out-dated) job, Mevlut can only talk of it with love. Dickens is an interesting comparison because what Pamuk most seems to lack is Dickens’ range of tone – this is a novel without humour or anger, satire or pathos – his voice instead stuck in a folksy ‘story-telling’ mode. A Strangeness in My Mind is certainly a better novel than The Museum of Innocence, but it strikes me that Pamuk’s pre-Nobel novels are much better than those he has written since winning the prize. The length of both suggest self-indulgence, a writer who can no longer edit himself or be edited. His presence on the Man Booker International Prize short list indicates that he still has his admirers – he was certainly an ever-present when it came to the Independent Foreign Fiction Prize – but I would have much preferred to see the work of fresher (female) voices represented. No great surprises here. The Vegetarian has been, rightly, lauded since it appeared, and the publication of Han Kang’s second novel in the meantime, Human Acts, has enhanced her reputation. Similarly, praise for Elena Ferrante’s Neapolitan series has gathered strength since My Brilliant Friend was ignored by the Independent Foreign Fiction Prize in 2012 and, though increasing popularity has brought detractors, The Story of the Lost Child is generally seen as a fitting conclusion to a considerable achievement. Perhaps less obvious, the inclusion of The Four Books surprises no-one who has read it – it was a novel in which drew praise from all the Shadow jurors. There were some regrets that Tram 83 narrowly missed out (hopes it might appear on the official list were quickly dashed) and only the rather eccentric A Cup of Rage was quickly dismissed. The one controversial entry (discounting one juror’s loathing for Mend the Living) was Death by Water, the jury divided between those with a love of Japanese literature (and Oe in particular) and those with less experience (or, as I would say, patience). As my only prediction this year was that a woman would win, I was particularly pleased. It strikes me that the variation in choices results from a different view of both the Prize’s intention and of the purpose of literature. Though the previous Man Booker International Prize often rewarded difficulty, it now, like the IFFP, seems to have one eye on the market. Agualusa and Pamuk are known quantities, past winners, and are writers you are likely to already find in a bookshop. 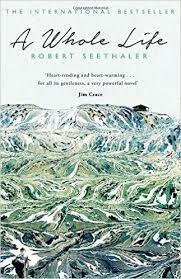 Seethaler is, of course, appearing in English for the first time, but even before his long listing, he was subject to a marketing campaign by Waterstones. All offer something pleasant and harmless – something ‘apolitical’. Except that it is, of course, very political, presenting exotic poverty and suffering to us as a form of literary tourism. In A Whole Life we are asked to accept that Eggers’ years of loneliness and hardship are somehow redeemed because he lives on a nice mountain; similarly, in A Strangeness in my Mind six hundred pages of scraping a living are presented as the path to happiness; and in A General Theory of Oblivion violence, torture, colonialism, and civil war all vanish into the sleeves of its magician author while he distracts us with narrative tricks. 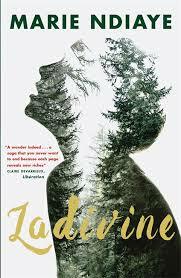 Compare that to Ladivine, a novel which is genuinely puzzling and unsettling. The good news is that it is highly likely a novel on both shortlists will win the official prize. For the Shadow Jury, I think the decision will be a lot harder. Yan Lianke’s The Four Books (translated by Carlos Rojas) is set in a re-education camp in China during the Great Leap Forwards when the country was desperately attempting to improve its economic performance via industrialisation on fast forward: the result was widespread famine. Yet it does not read like a historical novel as Lianke, perhaps fearing censorship (though perhaps not – after all, George Orwell retold the Russian Revolution using a farm full of talking animals), tells the story allegorically without reference to specific dates or places, assigning his characters generic names such as the Scholar and the Musician. The story is also told, as the title suggests, through four different narratives (like four Gospels): a quasi-religious book called Heaven’s Child; the official (Criminal Records) and unofficial (Old Course) writings of the Author; and a final book, A New Myth of Sisyphus which acts as a coda. The person didn’t say anything. The Child turned again toward the painting as though he were about to pee on it. Ironically, it is through Criminal Records that many of the prisoners’ secrets are revealed to the ‘higher-ups’ rather than through fellow prisoners informing. This scene makes clear that it is the target-setting and reporting which count, rather than the production. At one point, in attempt to improve yield, the Author uses his own blood to irrigate a field of grain, a symbolic act as well as one of desperation. Steel production is beset by similar problems, but also devastates the landscape as trees are cut down as fuel for the furnaces. The Four Books is more than political satire, however. Despite the character names, they are not portrayed as types but as individuals. Particularly moving is the love between the Scholar and the Musician, and the lengths they are prepared to go to for each other. All the characters – including the Technician with his frequent betrayals, and even the Child, who understands little beyond the system he must implement – elicit sympathy. 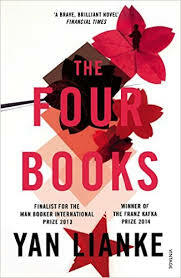 The Four Books works so well because it can be read as a portrayal of a particularly grim episode in China’s history, or, more abstractly, as an allegory of human behaviour in a system of reward and punishment. It also balances its despair with moments of hope, perhaps best exemplified by its almost Beckett-like ending (before A New Myth of Sisyphus). Most surprisingly, perhaps, it is eminently readable, the type of novel where three hundred pages fly by. It fully deserves its place on the Man Booker International Prize long list, and should, if there is any justice, make it to the short list. Only one third of the way through do we reach Ladivine’s story, on holiday with her husband, Marko, and two young children, Daniel and Annika, in a country which remains unnamed but which we might assume is the home of the original Ladivine. Once again, NDiaye moves from the present into the past in order to explain Ladivine’s journey to this point. Marko is German and Ladivine now lives in Germany as if to emphasise each generation adopting their own identity, their own language. This vacation represents a break from Marko’s parents where they normally holiday, again raising the idea of generational discord. This culminates in an act of violence by Marko (a scene which literally caused the hairs on the back of my neck to stand up) which causes them to leave their hotel and stay with friends of Ladivine’s father, Richard. Throughout this we see Ladivine drifting from her family just as her mother and grandmother did before her. Perhaps the animal spirit of the dog is a sign to both Clarisse and Ladivine that the past cannot be disowned. Ladivine is not an easy novel – its prose style can be stand-offish, its characters act without clear motivation, and it is no respecter of genre, playing tag with realism like a wayward child. Its very awkwardness, however, is a reflection of NDiaye’s unforgiving intensity. Women writers may be in a minority on the Man Booker International Prize long list, but it would not surprise me if that were to be reversed by the short list. In this Agualusa conveys the damage the country’s mineral wealth has inflicted, as well as the danger of the uprising. Ludo, meanwhile, running out of food, takes inspiration from her dog, Phantom, when she sees him devouring a pigeon he has caught. Lacking his agility, she sets a trap, baiting it (of course) with diamonds. In this way she catches a number of pigeons until she encounters one with a message attached from one lover to another. In sympathy she lets the pigeon go, and turns her attention to her neighbour’s hens instead. The pigeon cannot outfly its destiny, however, and is caught by Montes (the man who earlier shot the Portuguese soldier, Jeremias) who is now homeless and equally in need of sustenance. He, of course, finds the diamonds inside. (And in case you thought we were done with Jeremias, he too will reoccur until the final pages). You may be fearing that this summary reveals the novel’s plot, but at this point we are barely one fifth of the way in. Agualusa weaves his plot as a spider its web – an object of beauty from afar, but less appealing to be stuck inside where the intricate connections can seem random at times. These connections are largely at the expense of character – even Ludo, the story’s centre piece, is ‘the woman who bricked herself in’ and, though she develops a relationship with a boy later, she remains oblique. Other characters, such as Montes and Jeremias (there are more), undergo changes, but these tend to be related to adopting new identifies in response to persecution or opportunity rather than character growth. The frequent chapters can give the impression of a stone skipping across the water, only making light contact with events before moving on. Or this, describing Montes hiding in plain sight by pretending to be mad: “his lucidity travelling like a stowaway.” But if these are diamonds, there is a danger that the reader is the pigeon, delighting in words, but oblivious to the suffering behind them. Such is Agualusa’s love of story-telling that there is little time to experience the deeper emotions of his characters, and, in a novel which deals with violence and persecution, this can appear glib. 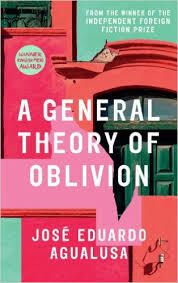 A General Theory of Oblivion is an enjoyable read but one, as its title suggests, which does not leave a strong impression. The novel begins with Lucien, a would-be writer, returning to the town, met by his old friend Requiem (though, as we will discover, their friendship has a dark and complex history). Requiem earns a living moving “merchandise,” with a side-line in blackmail. He is wealthy enough to live in Vampiretown, which, in colonial times, was the European quarter. Lucien is writing a play which he hopes will be performed in Paris; he was forced to burn the first version of this at gunpoint (interestingly, the novel reminded me of Jean Genet at times, whose first novel was destroyed by the authorities forcing him to rewrite it). The lines with which they attempt to hook their clients (“Do you have the time?”) echo throughout the novel, frequently interrupting other conversations. 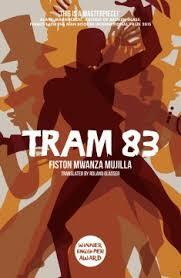 Tram 83, then, is, for all its pulsing narrative and exuberant characters, a rather bleak book which I admired rather than loved: admired, in particular, for its lack of condescension to a European readership, plunging unapologetically into the filth and stench of the bar and refusing to leave until the last drop is drunk. Although Eka Kurniawan was first published in his native Indonesia in 2000, it was only in 2015 that he came to prominence in the English-speaking world with the translation of his first novel, Beauty is a Wound. This, unfortunately, is not eligible for the Man Booker International Prize, having yet to receive a UK publication (though one is scheduled for June thanks to Pushkin Press, meaning that it could well appear on next year’s long list). His UK debut came the same year, however, with his second novel, Man Tiger, translated by Labodalih Sembiring. By Chapter 3 Margio is seven years old and we are following the family as they move to their new house, “a concrete square a few feet on each side,” and from there we travel even further back to Komar’s courtship of his wife Nuraeni. Kurianwan not only handles this complex structure with great dexterity, making the transitions seems natural, he also flits from character to character with the same ease. Chapter 2, for example, begins from Margio’s point of view, but changes to that of his sister Mameh halfway through. Each of the four family members is the focus of the narrative at one point, portraying the complex nature of the relationships which have developed over time. In this way, we learn of the deeply unsympathetic Komar’s early struggles on behalf of his family, and of the origins of his wife’s resentment. It works particularly well with Nuraeni’s sexual awakening later in the novel, when her character, previously rather over-shadowed by the others, bursts into three dimensions as she feels herself come alive again. Interestingly the two ‘versions’ of Margio’s motives coexist quite happily. The tiger can be read as a symbol of man’s propensity for violence, a belief Margio uses to disassociate himself from his own actions, or even a longing for a more primitive state in response to the encroachment of the modern world. It is reminiscent of magical realism, before that term was corrupted to include the cute and quirky – a non-rational occurrence believed by all within the world of the novel. In the novel’s final lines the two approaches come together seamlessly. 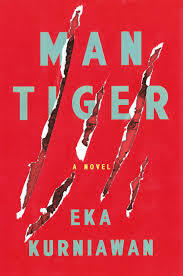 Man Tiger lacks the impact of a great novel, but it is a very good one, carefully constructed and beautifully rendered. Kurniawan is clearly a talented writer and it would not surprise me to find Beauty is a Wound listed next year. It’s a novel that would not be out of place on the short-list, but will perhaps lose out to the quality of the competition. Thursday saw the announcement of the long list for the Man Booker International Prize, slightly shorter than its predecessor the Independent Foreign Fiction Prize, but with a strong selection of fiction from around the globe. My first reaction is that is a particularly global list, with fewer than half the books from Europe, and representation from Africa, Asia and South America. Though there are only four women writers (the same as last year, though a better proportion), they are all strong candidates, and it would not surprise me if a woman won the inaugural Man Booker, just as a woman won the final IFFP. (In Marie NDiaye’s case I say that on the strength of Three Strong Women: in keeping with Booker tradition, Ladivine has not yet been released). I have already reviewed three of the books (The Vegetarian, White Hunger, and A Cup of Rage) and, as two of them made my best of the year list for 2015, and the third was released in January, it’s safe to say I’m pleased with their inclusion. I’ve also read The Story of the Lost Child, and, while there has been some disquiet about judging what is the fourth volume of a series as a stand-alone novel (I’m looking at you, Tony), it would seem unreasonable to exclude it on those grounds. Of the other books, Tram 83 has received a lot of praise, as has Eka Kurniawan – though much of this has been for the ineligible Beauty is a Wound. Raduan Nassar is perhaps a surprise inclusion, not only because, as he stopped writing in 1984, many may have concluded he was dead, but because A Cup of Rage is probably not long enough to be regarded as a novella. The list also includes two Nobel Prize winners, Kenzaburō Ōe and Orhan Pamuk. I’m disappointed with the inclusion of Pamuk, IFFP winner with The White Castle and also short-listed with Snow, as his previous novel, The Museum of Innocence, was one of the dullest reads I have ever experienced, and this one is another meandering tale of his love for Istanbul. Another previous IFFP winner is José Eduardo Agualusa – I found that novel (The Book of Chameleons) rather superficial so it will be interesting to see how this compares. In both cases it’s hard not to wonder whether the fact the Man Booker has the same permanent chairman as the IFFP has some bearing on their inclusion. (The same might also be said of Yan Lianke, who was short-listed for Dream of Ding Village in 2012, but I am much more excited about reading The Four Books). Inevitably there are some surprising omissions, particularly from Spain. The Boy Who Stole Attila’s Horse by Ivan Repila was my book of the year last year, and Jesus Carassco’s Out in the Open also made my top ten. In the Night of Time by Antonio Munoz Molina was also highly thought of, as was Agustin Fernandez Mallo’s Nocilla Dream. (Presumably Javier Maria’s Thus Bad Begins was eligible too). Sticking with the Spanish language, the inclusion of Yuri Herrera’s Signs Preceding the End of the World seemed a certain bet. Having said this, no long list can contain everyone’s favourites, and if this one only echoed my tastes I would have nothing left to read. It’s the voyage of discovery ahead that I’m most looking forward to. You are currently browsing the archives for the Man Booker International Prize 2016 category.